There is a price to be paid for wisdom as Odin the chief the Aesir – the Norse Gods of myth discovered, when he went in search of Mimir’s well beneath the world tree Ysgadril. Upon drinking deeply from the well of knowledge Odin plucked out his right eye and gave it to Mimir, the well’s keeper, for the gift of insight. 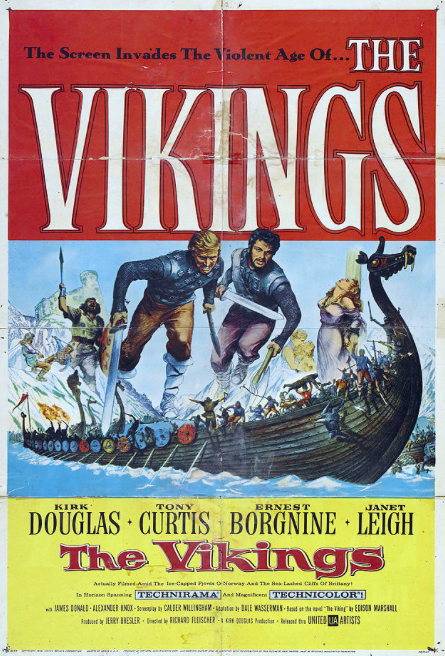 I was born in 1958, the year in which “The Vikings” starring Kirk Douglas and Tony Curtiss was released. When I was little, my dad used to drive my mum nuts by shouting “ODIN!! !” at the top of his lungs whilst in the bath holding a scrubbing bush aloft in lieu of a sword. I’m guessing he identified with Einar the character played by Kirk Douglas, son of Ragnar (Ernest Borgnine) and not Erik (Einar’s half brother sired by Ragnar) played by Tony Curtiss – who, whilst very good looking was not as butch as Einar. I still think of my dad as a Viking – he certainly had the strength in his day and was, with 5 children to his name our ‘All Father’. Our sister Abi had passed when this photo was taken: From left me, Dad, Nathan, Simon and Tim. Here he was pictured in Yosemite with Simon, the youngest of the son’s of Ragnar/Littlewood. He, like Dad before us and I is a carpenter and he plies his considerable skill in San Francisco. Wisdom flows from insight. In my case, insight is the knowledge that I have a disorder which renders me ‘blind’ to people’s motives (see Two Towers). I am emotionally more labile than most and I am given to an empathic response to the emotional state of others – especially when they are in need. There is a word for this: Eideteker – from the word ‘eidetic’ (used in conjunction with memory to describe an ability to recall something in great detail) – it can refer to a person who can ‘see through the eyes of another’. It was famously used by Hannibal Lecter to describe the skills of the homicide investigator Will Graham in the 2002 film ‘Red Dragon’. Given that most people follow their own agenda, I will empathise by default and often offer (unbidden) assistance. Favours, money, well meant advice, a well tuned ear, intuition …. This behaviour can be taken as interference, or more commonly, generosity of spirit. People I know think it is a good thing that I am this way – they see it as a ‘generous nature’. I find it bloody exhausting – because it is like having no skin. As a secondary school teacher I was considered gifted, partly because I had been a professional scientist before teaching the subject (I had real experience of making new science). In the main I think it was because I had no ‘off switch’ to the needs of students. I was promoted to Head of Year within twelve months of qualifying, becoming responsible for the pastoral welfare of over 200 hormonal teenagers. I counselled many youngsters, some I helped, all made deep impressions on me, through their emotional and educational need. I was advised by my Psychiatrist to give up teaching after I came out of hospital back in 2002, and by a very helpful careers adviser. So I don’t teach now, apart from the occasional carving or cabinet making tutorial in my studio to help pay the rent. Making furniture for a living is a solitary exercise, and this is therapeutic for me. I like it when my fellow artists sometimes wander down my dusty corridor for a chat, giving me the chance to procrastinate. But sooner or later I crave the peace and quiet of the workshop. Chisels, planes, set squares and marking gauges make no emotional demands, wood sings a quiet song best heard in isolation. The price I paid for my insight was to give up teaching. Having given up academia I felt the loss intensely. The loss of an eye is a terrible thing, the loss of a career, twice, could be seen as carelessness (Lady Bracknell). But I am lighter now in spirit and closer to the old gods and so I shout in my studio, axe aloft to my All Father, the God of wisdom, poetry, war, death, divination and magic. Manus is the zoological term for the distal portion of the forelimb of an animal. I’m a zoologist, I trained at Manchester University between 1976 and 1979 and stayed on to study centipede leg glands for a further three years. My wife asked me once “What does Ph.D. stand for?” to which I replied “Piled high and Deep”. I continued to pile it high and deep for another twelve years as a postdoctoral researcher, which is a posh word for a ‘drone’ or ‘lab monkey’. Until I finally had had enough and became a school teacher. I had much more fun teaching science to secondary school students and rugby to reprobates. Until I became ill. Years of very black moods interspersed with periods of intense creativity and manic energy caught up with me and I had a spectacular break down. It has taken me years to calm the Tsunami of emotions and the resulting fall out to regain a confident lucidity I have not felt since I was a boy. Eventually I was diagnosed by a very competent psychiatrist, having seen a rubbish shrink for several years prior who did not help one bit. In fact I suspect the antidepressants that were prescribed for ‘chronic depression’ were partly instrumental in bouncing me in to a full blown psychotic episode. But this piece is not about manic depression (a much more descriptive and robust term than the trendy BiPolar Type 2 I am labelled with). It’s no longer fashionable anyway, not since Catherine Zeta Jones and Stephen Fry made it cool. It is not cool. In zoological terms it is an annoying trait I may have inherited. This piece is about sanity. I free carved this bowl from a lump of Australian gum tree using a mallet and a series of chisels. It took me about two days of continuous tapping away at the chisel handle with my mallet to hollow out the bowl. The concentration required and the repetitive nature of the exercise was rather like zen meditation and it left me in a state of bliss. I have made plenty of rubbish bowls and lousy carvings in my time, but I still achieved that state of mindful bliss every time I carved. My mind is calmed by this kind of exercise. I believe that when the connection between the mind and manual work is at its strongest, for example during craft or art work that we move away from mental instability and achieve the centre ground. The key moment in human evolution was when our ancestors became bipedal freeing not only the forelimbs, but large areas of the cortex for communication. We used to make tools, hunt and gather – now we sit at computer screens and tap keys. We pile it high and deep. Branch out a little and make something, after all a busy manus is the foundation of compos mentis.